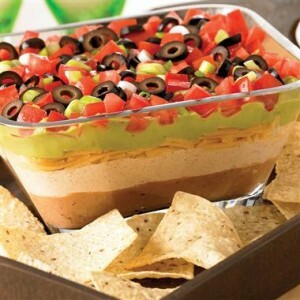 I thought this recipe was a no-brainer, but you’d be surprised how many people ask what the actual seven layers are in Seven Layer Dip. So here ya go. The secret is using picante sauce where so many people use salsa because it gives you just enough zing to cut through the creaminess. (It’s also technically 8 layers if you include the tomatoes on the top, but it will be so good that no one will complain.) Now go getcho chips and enjoy. If you want to serve the dip hot, preheat the oven to 350. Mix mayo and sour cream together. Layer ingredients in order, starting with beans and ending olives. Bake for 30 minutes, top with tomatoes and serve. Or, if you’re of the more impatient variety or you prefer this cold, add tomatoes, sit and chow.